Timeguard have upgraded the popular LED200 series of LED Energy Saving PIR Floodlights with even more benefits and features. We have taken on board customer feedback in the redesign to include a discreet 180° PIR detector with a 10m detection range and a slave terminal for control of up to 100W extra LED lighting. A maximum of 4 floodlights can now be wired in parallel to enable any detector to turn ON all lights connected. With a compact design, greater lumen output and of course our Fast-Fix pin connection for quick installation, the new LED200 range is a quality choice for new and existing installations. 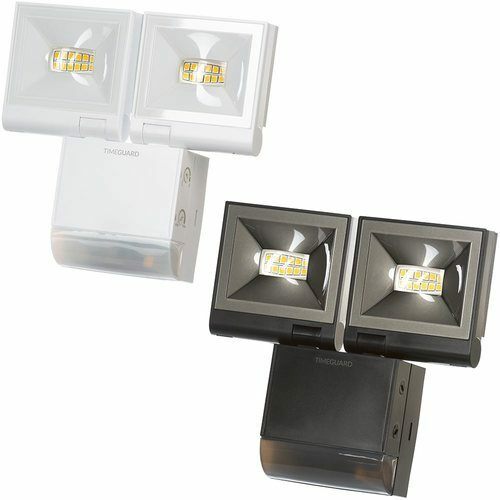 2x 10W Powerful LED compact PIR floodlight. 2x 840lm lumens bright white light. Operating temperature -20°C to + 45°C. Discreet 180° PIR detection with 10m detection area. Motion Detection Range up to 10m at 2.5m mounting height. Adjustable time setting 2 seconds to 30 minutes. Adjustable 2 x 200 LUX setting. Beam angle 90 x 90. Slave terminal available for additional external lighting loads; LED max 100W, halogen max 300W, fluorescent max 200W. Parallel switching facility a maximum of 4x LED100E/LED200E floodlights can be wired in parallel to enable any detector to turn ON all the lights connected. Excellent quality product, easy to fit and for me good override options. Only minor downside for my use of it is the left / right adjustment, could have done with a little more angle.